Actually this spot is for hang out with friends, spend time by chit chat and coffee. As by the name, Koffie means coffee, Warung means shop, Tinggi is Tall. Not sure how history of it, but as seen, this place has been exist since 1878. I assume they have long history about it. 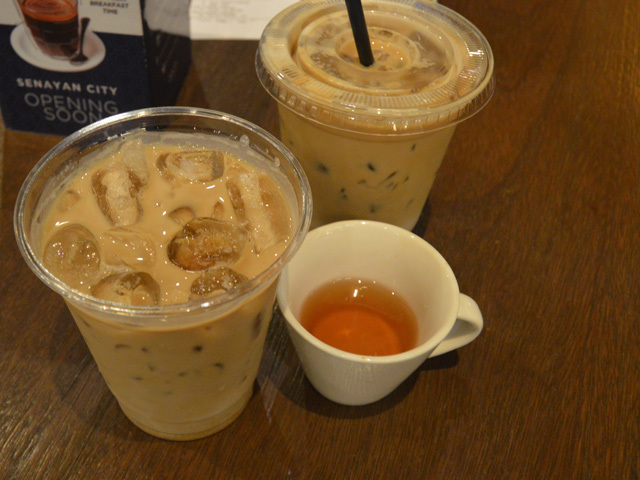 By the concept, they serve various of traditional coffee also with modern coffee. Among the coffee, they also serve bunch of Indonesian food e.g. 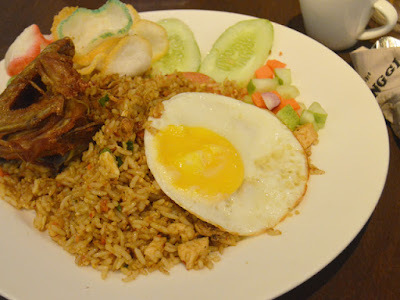 Nasi goreng, bakmi goreng or others similar dish. Restaurant is categorized by two spot which is non-smoking area and smoking area. But in fact, two area doesn't have any walls or separated which is you could smell the smoke from the other side. At first i found out the waiter is friendly and nice but what sad is, he is kind of lack information about the menu. I need to twice to ask what special menu they have. This time i only try the Salted Caramel Latte which is recommended with star. I am shock what come out is coffee in plastic glass just like what i baought usually at the Starbucks, coffee convenient store. Good thing is, even though bad presentation, coffee has really great flavor. It is balanced between sweet caramel and bitter of coffee. While at here, i also have dinner by Nasi Goreng (fried rice). Such a huge portion for person, it is completed with fried chicken, chicken cubes, pickles, fried egg and crackers. It sure have great taste, well seasoned. Chicken also crunchy and well seasoning. Overall, this place is more recommended for having coffee while hang out with your friends, thay have nice food too, but for typical Indonesian dish, i think they have bit overprice.